It’s when I see Mimi like this, relaxed, quietly happy by a sunny window, breeze ruffling her ears, her delicate features so lovely with the lace curtain, that I deeply sense she and I are both having a moment of appreciation for her life here, indoors, spayed, well-fed; often after one of these moments she turns and looks right at me, aware we are sharing the same sentiment, as she did some time after I took this photo when I’d simply stood admiring her. 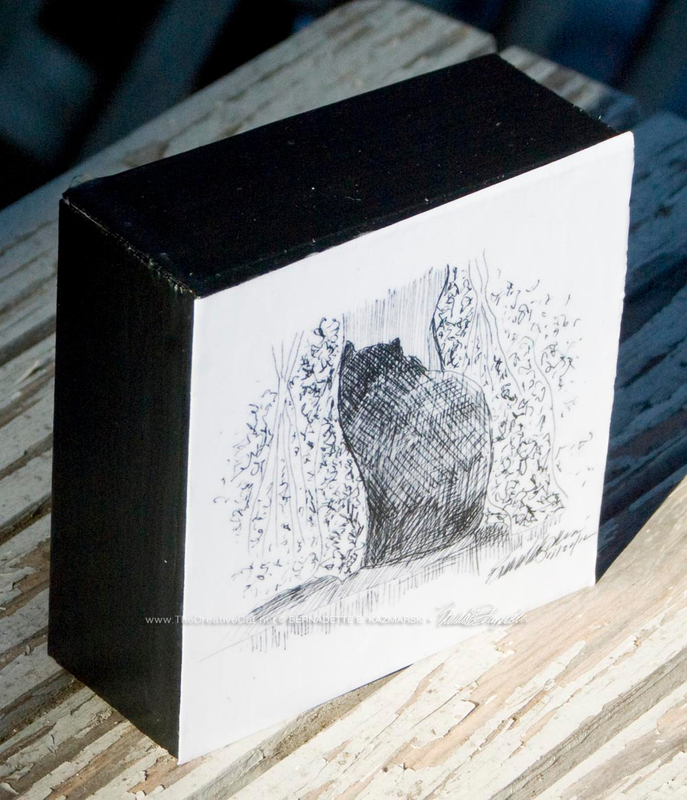 These 4″ x 4″ blocks, originally intended for painting, is a 1/8″ birch wood panel “cradled” with 1″ x 1″ pine wood added to the back for strength and stability and, incidentally, ease of hanging. And because they have wide sides the smaller ones can even stand up on a tabletop or shelf. I’ve painted the sides white and mounted a print edge to edge on the top surface, then covered it with acrylic finish. You can find this one in my Etsy shop! “Looking Out the Window” wood-mounted ink sketch. In this ink sketch Jelly Bean peeks through the cafe curtains as I sit at my desk working after dark; what he can see out there is probably something I would never be able to see, but he is raptly attentive. 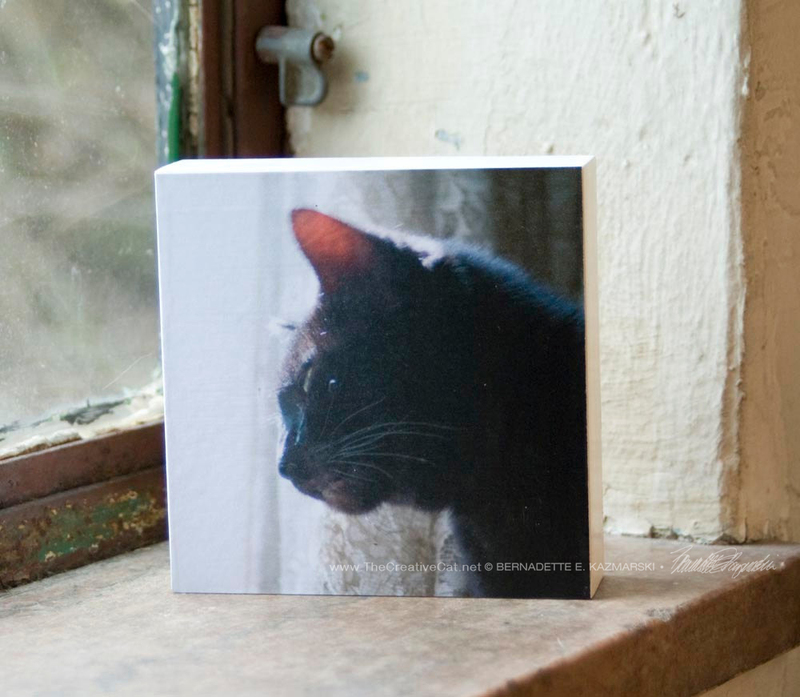 You can see the original sketch in the last image in this gallery or on The Creative Cat at http://thecreativecat.net/daily-sketch-looking-out-the-window-2/#.ULJrDGcZ9o0. The 4″ x 4″ block, originally intended for painting, is a 1/8″ birch wood panel “cradled” with 1.5″ x 1.5″ pine wood added to the back for strength and stability and, incidentally, ease of hanging. And because they have wide sides the smaller ones can even stand up on a tabletop or shelf. I’ve painted the sides black and mounted a print edge to edge on the top surface, then covered it with acrylic finish. You can find it in my Etsy shop. I have no idea what disturbed Bean’s bath and held him and Mewsette with rapt attention, but it took an enormous number of whiskers and individual hairs to accomplish it, a few toes too. The 4″ x 4″ block, originally intended for painting, is a 1/8″ birch wood panel “cradled” with 1″ x 1″ pine wood added to the back for strength and stability and, incidentally, ease of hanging. And because they have wide sides the smaller ones can even stand up on a tabletop or shelf. I’ve painted the sides white and mounted a print edge to edge on the top surface, then covered it with acrylic finish. It’s in my Etsy shop! And below is a little suggestion of how a customer arranged her wood-mounted art. 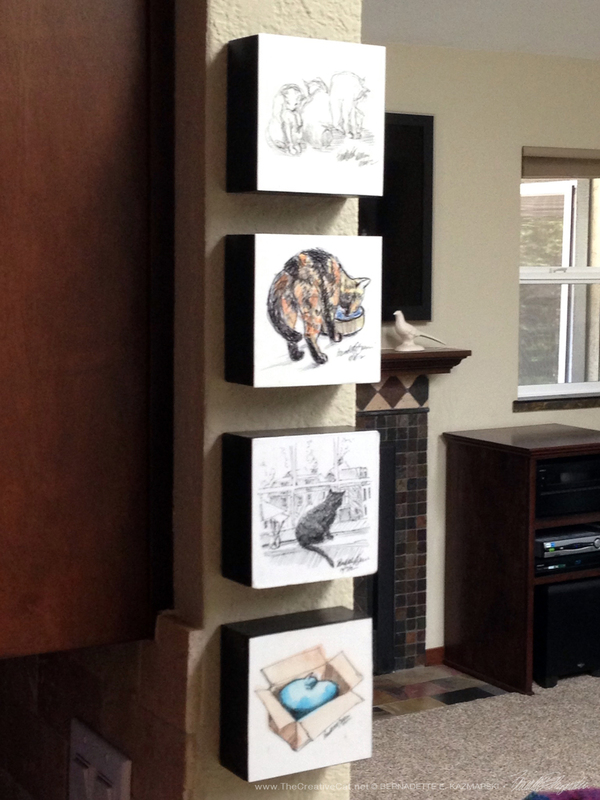 How a customer hung her wood-mounted art. It’s all done under the close and careful supervision of my studio cats!. 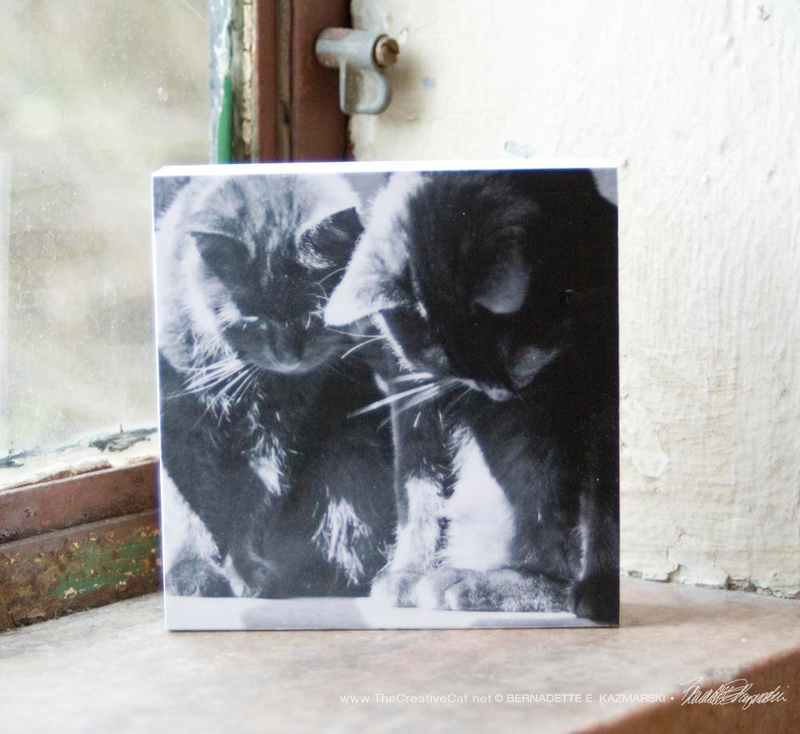 This entry was posted in black cats, wood-mounted artwork and tagged animal artwork, black cats, cat art, cat artwork, cat merchandise, cat photographs, cat photography, cat sketches, cat-themed gift items, cats, feline artwork on May 12, 2015 by Bernadette.